Around 600BC, During the ZHOU DYNASTY the royal house preferred the colors of gold and silver, read and black eventually replaced these metallic colors as royal favorites. In Egypt, the lower classes wore pale colors, High society painted their nails Red. By the turn of the 9th century, nails were tinted with scented red oils, and polished or buffed, people in the 19th century early 20th pursued a polished look rather then a painted look by massaging tinted powders and creams into their nails. buffing them shiny, Graf's Hyglo was sold as a paste around this time. 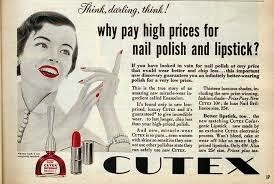 If was after the creation of Automobile paint that Cutex produced the first modern made nail polish in 1917, In 1932 the Charles Revson Company (Revlon later) produced their first nail polish. I honestly had no idea that nail polish dated that far back. I learned something new! That is great, and wonderful information about nail polish. Thank you for sharing:). Love this blog! Very fun and informative. I bet you if Cleopatra was poor, she would still somehow find away to wear red nail polish. That is a cool lesson! i am sure my daughter would love to learn all this.. I knew some of the history behind nail polish, but definitely not all of it. Thanks for sharing! Well, I learned something new today! It was awesome to read the history of nail polish. I haven't painted my nails in a while. Nice to know when nail polish started and it's been quite a long time in history. Oh wow aha! That was a fun read! I loooove nail polish... 300+ bottles and growing! This is something I don't think a lot of people know. I love finding out about the history of products. Thanks for sharing. What Great Information Who Would Of Known Thank You For Sharing! That's so interesting. I never knew nail polish has been around for so long. It's really neat to see what they used to make it out of. That's pretty cool! I never actually thought about the history but thanks for sharing! Who would of thought about the history in nail polish.. I'm a pink and red kinda girl but love other colors as well. I am not much into Nail Polish thanks for sharing its origin. That's interesting about the shades signifying class status. Who knew? I Know nothing about nail polish but i love to read about history, and this is an interesting post. egg whites? Sounds like it used to be more natural way back then now they just fill the bottles fun of chemicals. Thanks for sharing that information about nail polish. I never knew how they made it before. Thanks for the history lesson. I am a polish fanatic! that great information! I had no idea! Thank you so much for the history of nail polish. I love learning about things that I love. It would of been nice if those pictures were clickable to a bigger size so you can actually read them. Very interesting read indeed. As I look down at my purple nails. Who would of thunk, Surely not I.